How to learn to draw. (I cannot draw). How to learn to write. (I also cannot do this – that should be obvious by now). How to get a contract working for Marvel or DC off the back of your comic. (I’m pretty sure this never happens – it certainly shouldn’t be your only aim. You should be creating your own comic for the love of it, dude). This is the key thing to think about, but so often people seem to forget about it. OK, you have this awesome idea for a comic, and you’re pretty sure that it’ll sell. C’mon, if it was already on sale you’d buy it! Surely that’s proof that it’s a great idea? No. Sorry. You need some data there. Otherwise you run the risk of ending up with a bunch of comics that you’ve paid for and no outlet to sell them. That’s going to be crippling to both your bank account and your self-esteem, so let’s try and avoid it, shall we? I’ve put it in bold and all caps. That’s how important this is. It’s the single best way to find out if people like your comics and will pay for them. If you’ve got a regular webcomic you can track the hits you get, you can communicate with your fans and ask them if they’d like to see your work in print, you can sell things online (which is much less satisfying than going to Thought Bubble and blowing through all your stock in one go, but much more stable as a long term strategy that doesn’t call for you to attend every convention in the world). There’s a lot you can do with a regularly updated webcomic. Money! Sweet, sweet money. Money that isn’t coming from your own pocket to pay for the printing costs. Risk free money! Proof of market. KS is essentially a pre-order system at base. Your backers are definitively telling you that they like your idea enough to lay down cash for it even though they haven’t seen the product. If you meet your funding goals you know you’re onto a winner. A solid contact base to build on. These people who are telling you that they like the cut of your jib? They’re probably going to like the cut of your next jib as well. All of a sudden you’ve got a fanbase, kiddo. You’re a star! My point is, even if you’ve got a fully-funded Kickstarter and a billion pre-orders, you can’t stop there if you want to make this work. Becoming relevant is hard, but it’s wasted effort if you’re not going to work to stay there. That means getting to know the key players in the small press scene, engaging with the community & your fans & always looking to the next project. It can be tiring (or so I’m told) but it’s a lot of fun. Learning the schedules for conventions will pay dividends – there’s no point having a bunch of books ready to sell and missing all the cons because you didn’t book in time. It’s also worth keeping an eye on what other creators are saying about specific conventions so that you can pick and choose which to attend. Different cons have different audiences, and there’s no point you turning up with your horror comic to a con that mainly caters to a family audience now, is there? Update: a brief digression on conventions. Since this post was originally written the number of UK conventions has expanded from “a lot” to what scientists are calling “approximately all”. There is a frankly staggering number of cons of various shapes, sizes, flavours, and specialities to pick from these days. Some cons will fill up really quickly because they have strong reputations, some will be new additions to the scene and worth a look to get in before they really take off; there’ll be a con that maybe isn’t for everyone, but serves the niche your comic fits really nicely. There’ll be one near you that’s worth checking out as a toe-dipping exercise. There’ll be a few that curate their attendees list & require submissions for consideration by the organisers (including, from 2016, the granddaddy of them all – Leeds’ mighty, mighty Thought Bubble). All of them will have different cut off dates for applications, different pricing structures, and different rules on what you can and can’t do. This, for new creators, can be a bit intimidating. Which is why everyone owes Luke Surl a debt of gratitude. Because he’s made a very helpful thing that you can take advantage of. That thing is ComicShowTables and if you’re interested in the scene you should absolutely go and subscribe to it right this minute. Once subscribed you’ll get emails from show organisers letting you know when tables become available to book, meaning you can beat the rush. You’ll also be among the first to know about newer shows, giving you more options for places to sell. It’s really a great idea – I wish I’d thought of it. Thanks, Luke! Have you thought about your costs and how you’re funding this? No, but really. Like, REALLY thought about it. Because if you haven’t you’re in for a world of hurt. We’ve seen all sorts: people who took a guess at how much they thought printing would cost, factored it into their KS campaign without checking, met their funding goal, and discovered that they’d under-budgeted by about 50%; people who did a “test the water” print of 50, paid a really high cost per unit as a result, and had to come back the next week for another run because they hadn’t figured how high demand would be; we’ve even had people who deliberately sold one of their books as a loss leader and couldn’t work out why they were losing money (it was because everything else looked overpriced in comparison). These are extreme examples, but they do happen – don’t let them happen to you. There’s a general rule which holds firm throughout the printing world: “More is less”. Or, to put it another way – costs per unit go down (pretty dramatically in some cases) as the number of units rises. Now this is where knowing your market comes in – we try to help by giving prices on two or three quantities for every quote that we send out, but we don’t know what your audience is. If you sell yourself short by ordering 50 copies, only to discover that you have 100 customers, you’re going to end up robbing yourself of profit that you could be using to fund your next project. Now I get that it’s scary to lay out the money for 100 copies when you’ve only made 45 presales so far. I get that. But look deeper. How long did it take you to make those presales? Has the flow dried up or is it still coming? If you’ve been running presales for two months, got to 45, and haven’t had any new orders in the last fortnight then sure – go ahead and order 50. But if you started taking orders last week and are still getting in the occasional order (one or two every couple of days) then be bold! Back yourself to sell the 100 – get the better unit price and give yourself a better chance of making a profit. It might not work, but 9 times out of 10 it will. It’s the same with upcoming cons – keep a record of what you sell at each convention you go to & use that to base order numbers on for your next project. 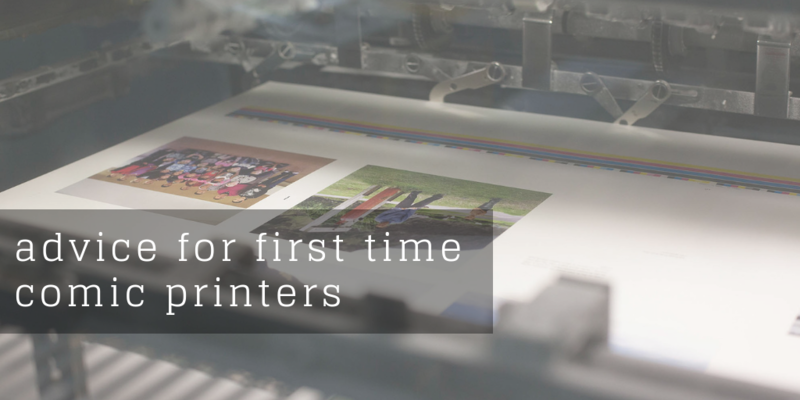 Engage with your printer & be honest about your situation – don’t be afraid to ask for credit as long as you know that you’ll definitely be able to square the debt. An example: I had a client a few weeks ago who told me they wanted to get a decent number of comics, but they couldn’t afford to until payday, which would be after the convention they were attending. OK, that’s bad planning, but they seemed like good people, I liked their book, we’d had a lot of back and forth on email. Fundamentally, I believed I could trust them, so I took a chance and arranged a 50/50 payment schedule with them. Which worked out perfectly. No regrets there at all – they got their books at a decent cost per unit, I got to help them out, and the company got paid. Now I’m not saying that every printer will work in the same way (hell, I’m not even saying that I will all the time!) but asking the question, as long as you explain your reasoning, isn’t going to hurt. This one comes up a lot, especially for first timers. Do you know how long it’s going to take to print your comics? What if there are unforeseen technical hiccups (which there will be – we’ll get to that in a minute)? You need to make sure you’ve factored in time to get your project to print and delivered back before you need it if you’re going to remain calm. Ask your printer when you agree on your quote how long it’ll take. Then double what they tell you. Congratulations – you have now left enough time to ensure that you get your stuff back without inducing stress-related heart attacks in everyone involved. You’ve also given yourself a much better chance of getting back books that are perfect because they haven’t been rushed through. Well done you. You need to consider every reasonable factor. Are you planning on asking for a physical proof? OK, well that needs to be mentioned as soon as possible when discussing the quote. Not only will it affect pricing, it will also add days to your lead time. Your printer is almost certainly not going to be factoring in a physical proof unless you ask them directly, because they’re pretty rare beasts these days. If you have an inflexible deadline (a launch party, or a convention appearance, for example) you need to agree your schedule as early as you can and make sure you stick to it. You’re going to screw something up. You’re still going to screw something up. The most typical technical issues we encounter are to do with bleeds and (in perfect bound books) clearance from the spine. Sometimes these are trivial fixes which we’ll handle in an hour or two for you – you’ll probably never even know we did it. Sometimes, though, they’ll either be complex fixes or else they’ll be things we can’t fix on your behalf (we’ll tell you how, and offer all the assistance we can, though). If you’re unlucky enough to fall into this bracket then you’re going to need to brace yourself for another day or two of lead time. There isn’t room here (well, there is, it’s the Internet, but you won’t keep reading. I’m surprised you’re still reading this far, to be honest) to cover all the potential technical issues that might come up. Realistically, though, you’re not going to come up with a problem we haven’t seen and solved a million times before. So I’ll close out by repeating once more – get your files into your printer’s hands as quick as you can (even WIP files are helpful for nipping problems in the bud) & let us deal with the technical side of things. You go get back to doing what you do best – creating awesome comics. That’s the best advice I’ve got for you. Originally posted on Comic Printing UK and shared with permission.